In the winter of 2015 I was in London in pursuit for Adobe training and certification in Digital Publishing Suite, HTML5 and CSS3. Along the line, there was the need to use Adobe InDesign, Adobe Dreamweaver, Adobe Photoshop and Adobe Edge Animate. Getting used to coding and programming languages found in HTML and CSS was not a child’s play. These two were really needed in many ways. For instance, for those used to the DPS, we all know that the key Adobe tool for digital publishing is the InDesign. But the HTML can also come in handy especially using hyperlinks or buttons to create links to websites to display either in the external mobile browser or in an in-app browser; creating web content overlays; and creating folders with HTML assets and importing them as articles instead of creating them with InDesign documents. Then delving into building a website from the scratch with the help of Adobe Dreamweaver and the design of a website front-end with the use of its brother, Adobe Photoshop became another feat. The lecture seemed like it was never going to come to an end. When it was time for Edge Animate, the lecture ended too quickly for my liking. Moving texts, objects and images, converting the finished animation to MP3 or linking it to a website became fun. To me, it became a replacement for Adobe flash! For me, I’d say that Edge Animate is a very powerful, intuitive software tool that enables you to create interactive animations for the web, iBooks, and iPhone, iPad and android apps. Other reasons are based on responsive web design, interactivity, intuitive timeline, familiar drawing tools, importation of fonts, customization work-space and many others. 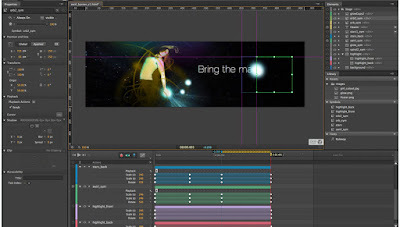 However, with the rumoured discontinuation of this tool by Adobe and the introduction of Adobe Animate CC, a lot of developers have continued to frown at it. Edge animate makes life easier since it’s a DOM based tool cool for developers unlike the Adobe Animate CC which is canvas based animation for web. The former gives more control, power, and flexibility for controlling animations. There are also lots of features when talking about Edge Animate for example: path tool for custom shape drawing instantly, 3D, creation of hyperlinked buttons etc. But above all, Adobe tools are worth laying hands on.